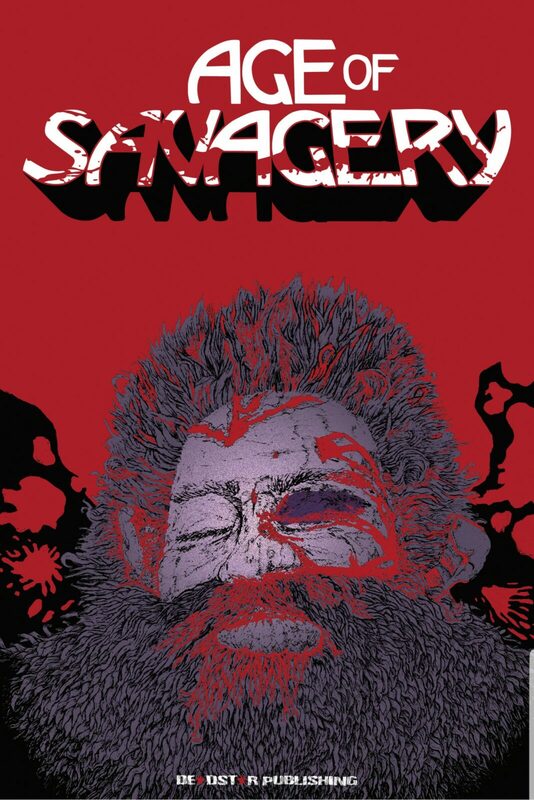 Deadstar Publishing presents Age of Savagery, a collection of stories featuring barbarian tribes as they struggle to survive in a world abandoned by magic and filled with violence. 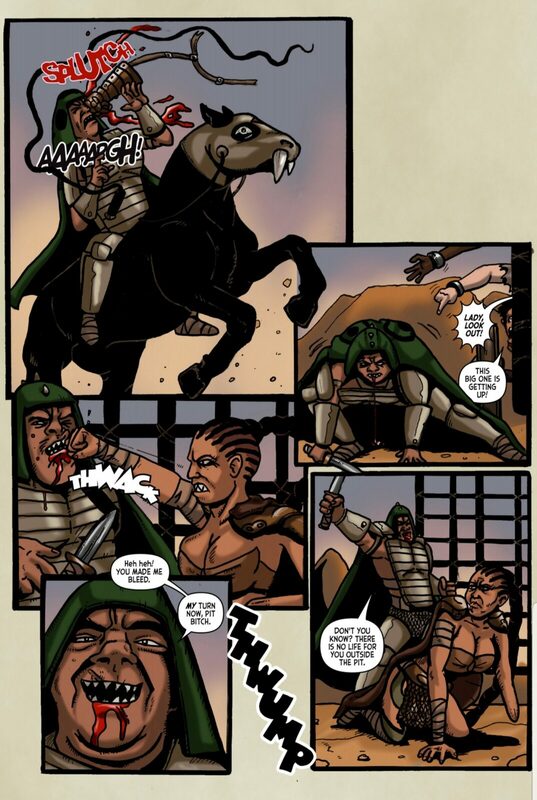 Featuring 10 stories from over 20 creators, this 80-page graphic novel was birthed from the imagination of David Powell. 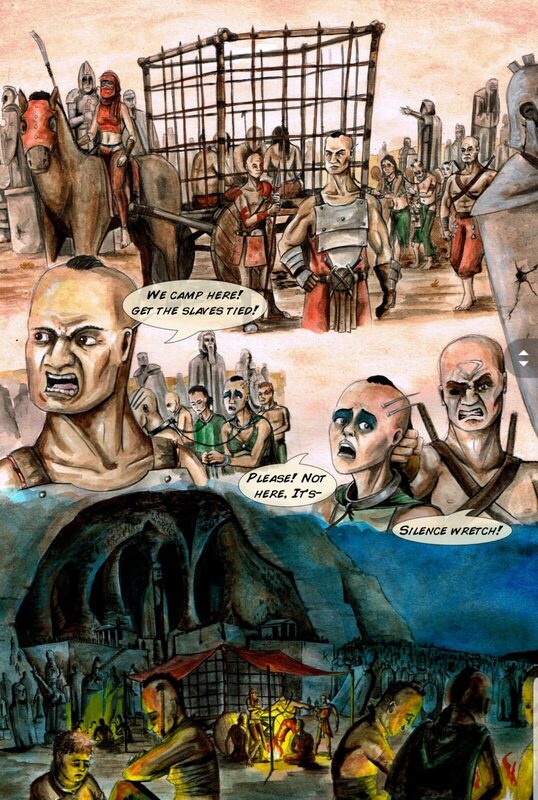 Creating a cohesive storyline in this setting is a tremendous task, this book attempts to do so by including both graphic novel and prose stories designed to further expand this universe. For the sake of brevity, I will only be reviewing the graphic novel parts of this book and will give my overall impression of the book without the inclusion of the prose pieces. Titan by Josh Somerville is a great way to start this collection. This short story (10 pages) does a good job at getting to the story quick; the main character is the last survivor of his slaughtered clan. Driven by compulsion, he seeks out the fabled Titan at his mother’s last request. 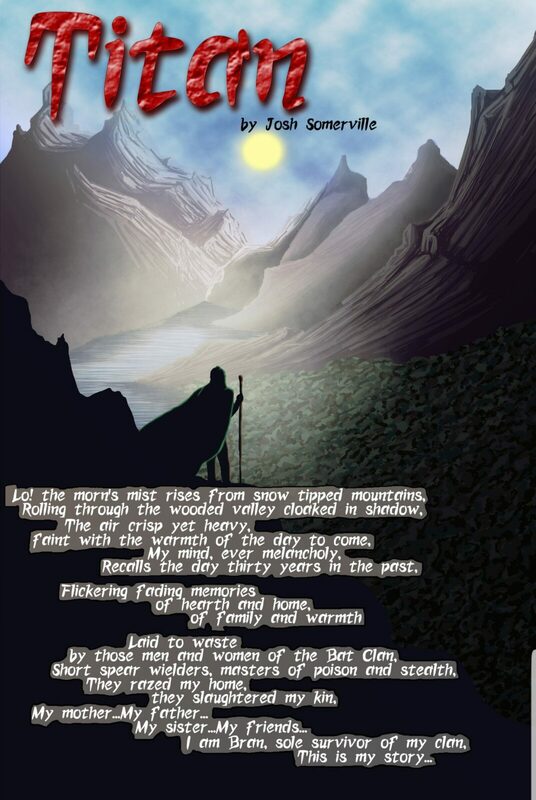 The opening page of this story is a beautiful panel portraying a mountain landscape with a rising sun in the background. 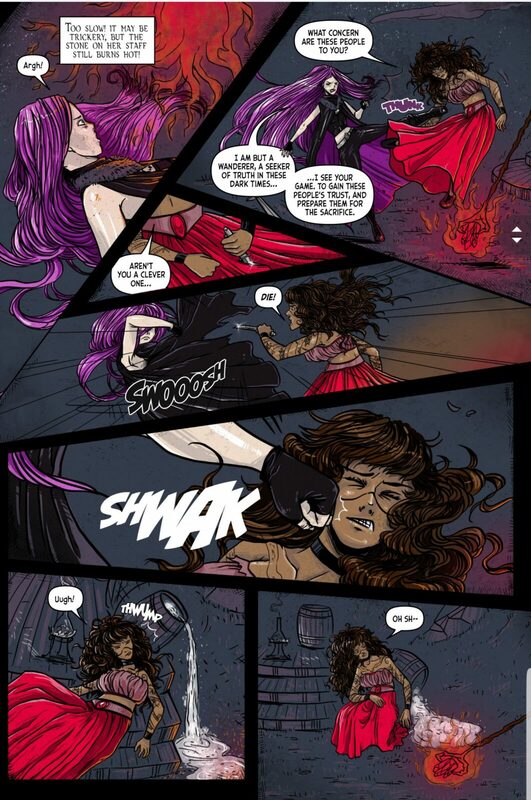 The vibrant colors are fantastic, it greatly helps enhance the art, and the lettering style helps you become invested in Bram’s thoughts while forcing you to take a second look and admire each panel. I give it a 3 out of 5 due to the limitations of the story length. Wonders and Visions by Mark Adams, Atlantisvampir, and Nikki Foxrobot is lower in standard than what Titan presented. The story is simple, a stranger is exploring the world hoping to find magic in the land. The unnamed protagonist stumbles across a woman displaying her magical powers as a means of collecting food and payment from a village seeking her protection. Coming in at 7 pages, this story suffers from poor, inconsistent art that is nowhere close to professional. The colors are decent, but they help draw attention to the flaws in the art; the action sequence does little to present this as a professionally drawn piece. I give it a 1 out of 5, for the inconsistent art, the rushed story, and the lack of development in the main character. Only One by David Powell deals with the brutal aspects of tribal life as one tribe is subjugated and enslaved by a more powerful clan. It tries to put focus on one man as he deals with his daughter’s capture and his attempt at rescuing her. While this story maintains the overall connection to the grand world being crafted, it does not deliver any substance. The art is very unique and the colors do a good job at enhancing the night scenes; however, the story feels rushed and unfinished. Its a shame as a little more exploration could have set this story up as the beginning of the entire world, instead it falls just short of making a point. I give it a 2 out of 5 because it does have some potential to be something bigger with a few changes. Out of the Pit by Matt Warner, Arfon Jones, Capucine Drapala, and Nikke Foxrobots is by far the worst thing I have ever struggled to read. The art is atrocious and wholly inconsistent across the 7 pages dedicated to this mess of a story; the character it focuses on does nothing. The heroine can decapitate a man with a flying kick, yet the slightest touch of a whip disarms her. If there is such a thing as forced gore in a story, this is it; the colors do little to hide the atrocity that Out of the Pit represents. Words escape me as I try to describe the horrendous art, it destroys any merit that this scrabbled story could remotely achieve. I give this story a 0 out of 5, it should be a crime to charge any amount of money for this quality of work. Fishguts and Magic by Iain Shaw and Linzi Gold initially looked like a great palate cleanser after the previous story. 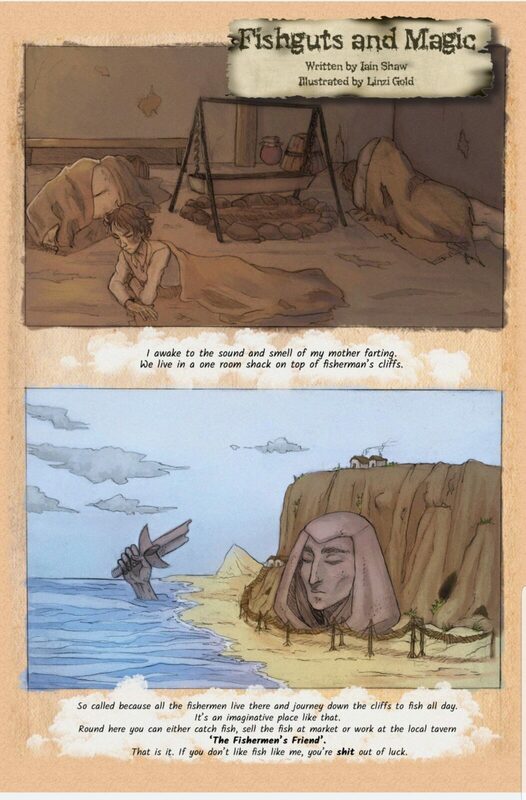 Those hopes are quickly dashed by the first lines spoken by the protagonist: “I awake to the sound and smell of my mother farting.” The very first panel allures to a fantastic art style with the gorgeous scenery as we are shown a large beach with a giant’s head peering from the sand. The colors helped give this panel an innocence found in children’s books which initially brought a smile to my face. That quickly disappeared by the 2nd page in this 10-page disaster. The story had potential; a group of people in this savage world has managed to stay out of the clan conflicts and leads a peaceful life. It could have been a great “slice of life” piece had it been handled differently. Each panel deteriorates in quality: from the story itself, to the horrible colors that seem to bleed into the page, to the disorienting speech bubbles. This story highlights how the magic in the world has disappeared, mirroring the feelings I have developed for this book as I continue reading it. I give it a 2 out of 5 because it clearly had some potential at the beginning, but much like the other stories in the book, it felt incomplete, rushed, and hastily put together to fill space. The inclusion of the prose pieces to further add to the mythos was a great idea, but with the quality of the pieces it feels more like an attempt to increase the page number instead of lore building. While it can be a great idea to use various creators to build a vast world, there needs to be some quality control and at least some attempt at editing. Except for Titan, this book highlights the reason Indie comics are seen so poorly by the general comic consumer. The first story feels as if it was placed there in hopes of duping people into spending $15 for what will certainly be massive a disappointment. There is absolutely no reason why this book should be priced so high for such low-quality art, story line, and character building. I honestly hope that this story idea is salvaged, and that the publishing house will use Josh Somerville and his team as the bar for every other creator to reach in any future republishing of this book. The idea behind this world building is great, but without proper implementation and oversight it will lack direction. Overall this book gets a 1.5 out of 5, instead of buying this book I recommend buying something for the less fortunate. To the publishers a gentle reminder: please stay out of Deviant Art and Tumblr when hiring future artists, we can tell.